PFC Timothy Ray Vimoto was born 2 Aug 1987 at Tripler Army Medical Hospital, Honolulu HI. He was the oldest of the Vimoto’s five (5) children. He was an Army brat living in places like Schofield Barracks Hi, Ft. Benning GA, Vicenza Italy x2, Ft. Campbell KY x2, Ft. Bliss TX, and Ft. Drum NY. He Graduated from Ft. Campbell HS in 2006 and was supposed to go serve a two-year mission for his church followed by going to college to play football. Instead, he surprised his parents by telling them that he decided to join the Army. When his father asked why, he responded by saying, “I’ve been watching the news and seen a lot of our troops dying… I feel it’s my turn to serve”. His father was touched by his reason while his mother could not hold back tears. His dad took him to the Recruiting Station the following week. His father told the Recruiter” this is my son Tim, he wants to join the Army, pls talk to him”. The Recruiter asked Tim what he wanted to be… without hesitation he responded, “I want to join the Infantry, I want some action”. Timothy enlisted for three years in the Infantry with an Airborne option. Shortly thereafter, he was sent to Ft. Benning GA for Infantry OSUT followed by Basic Airborne School. Upon graduation from Airborne School, he received orders to the 173rd ABCT in Caserma Ederly, Vicenza Italy. He was further assigned to B/Co, 2-503rd Airborne BN of the 173rd ABCT. He arrived just in time for the Brigade’s 15-month deployment to Afghanistan. His unit deployed in less than a month upon his arrival. His BN was responsible for the Kunar Province of the Brigade’s AO in the N2KL (Nangahar, Nuristan, Kunar, and Lagman). His company had the responsibility of taming the Korengal Valley which had been the training ground and home for the enemy for so many years. His platoon was sent on a mission to confirm and verified enemy presence/ occupation on known fighting positions on a hilltop not far from the KOP (Korengal Outpost). While on that mission, his platoon received accurate fire from enemies occupying positions on the hilltop. 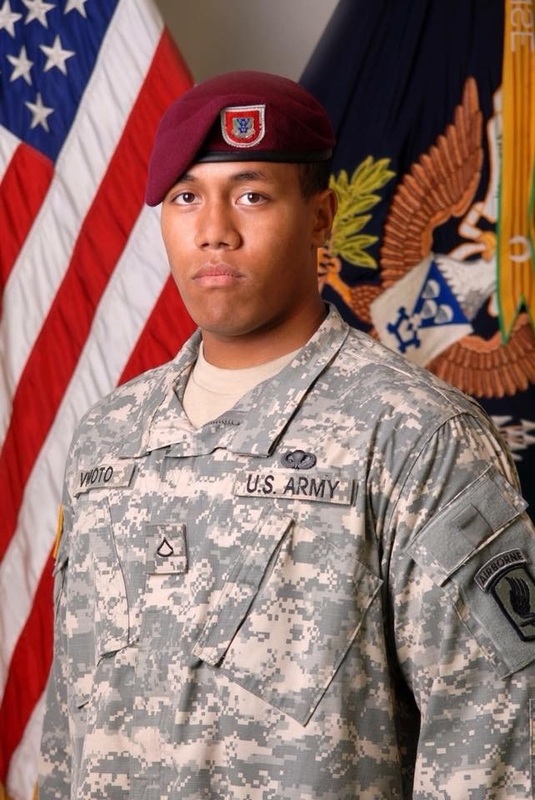 PFC Vimoto was last seen alive when returning fire towards the enemy. An enemy bullet pierced his helmet and struck him in the head. His Team Leader reported that PFC Vimoto died instantly. PFC Vimoto loved his family. He was an athlete who could play and was very good at all sports. He learned to love music at an early age listening to his mother play the family piano. He taught himself to play piano and had formal music lessons while a member of his middle school band. PFC Timothy Ray Vimoto is survived by his father (CSM retired Isaia T. Vimoto), his mother (Misimua), two sisters, (Sabrina and Ariel), two brothers, (Isaia Jr and Nephi), and two nieces (Giana and Kimiah).